PZ-900™ is a proprietary blend of natural enzymes and micro-organisims that assist in the reduction of organic waste in ponds, lakes and waste water lagoons. PZ-900™ works in conjunction with all of the Pond Biologics®, natural bacteria products, to kick start the decomposition process of algae and organic debris throughout an entire water body. 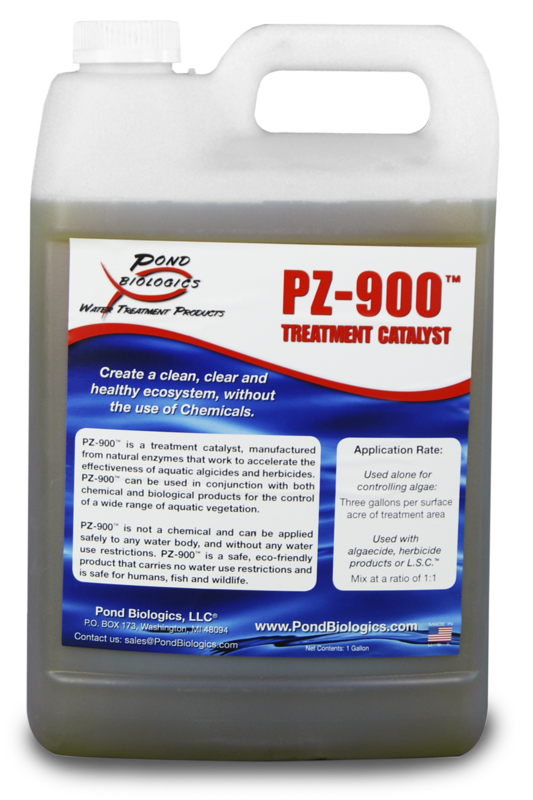 PZ-900™ can be used with all Pond Biologics® products, algacides and herbicides. PZ-900™ is not a chemical and carries NO water use restrictions. Safe for humans, pets, fish, wildlife and irrigation. Available in 1gal, and 2.5gal jugs. When used alone for algae control, apply at a rate of three gallons per surface acre of treatment area. When used in conjunction with L.S.C. and aquatic algaecides and herbicides, mix at a 1:1 ratio.